Today I learnt of the passing of such a great artist that his work makes my heart and soul ache with desire for it. And not only that, his art is fashion and anyone reading this knows my love of fashion. I've posted pictures of pieces by Alexander McQueen on here before so it's already known how much I admire his work. But that wasn't all, I also admired his breathtakingly spectacular catwalk shows and am envious of anyone who had the chance to attend them. Many talk of the wonder of the Chanel shows with designers such as Lagerfeld who prowl on stage at the end like the reigning monarch of cool. These were nothing compared to McQueen. His shows were true, exquisite performance art and can stand alone as an art piece without even considering the clothes themselves. But do consider the clothes. McQueen was said by the press to design unwearble fashion, but I can't see anyone being unable to find at least one piece among his work that they wouldn't glady add to their wardrobe. The key is not to walk out in them like you would in a McQueen catwalk show, but to take one item and see how spectacularly it enhances the rest of your look. I can see this and I have yet to afford one of his pieces. I just gaze at them with longing and want to cheer those who wear them with such style and brevity. Pure decadence, pure beauty and the inspiration behind them never seemed to come from anyone else in fashion. 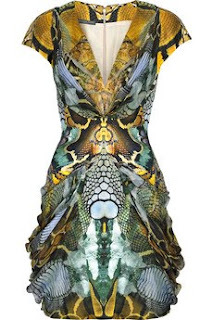 For example one of his most recent creations, the reptile print dress. Prints are back in, everyone is wandering the fashion capitals covered in chintz and geometric finery. Graffiti style is wondrously creeping back into the mainstream... and McQueen gives us a reptile print arranged so beautifully that it is like an abundance of the most exotic flowers. But miles better. It's made me appreciate reptiles all the more, and I'm already madly in love with the fabulous colouring of my friend Charley's bright orange and utterly adorable domestic snake "Penny". I'm the sort of person who prefers animal skin and animal print on the animal. Only rarely does someone design something wondrous enough to change my mind on this. Everyone's still making things out of alligators, snakes etc but not in the same way as McQueen. He's taken the beauty of them without having to cover things in their own skin. I even know someone who's bought an exensive handbag recently which comes with a letter stating that the snake died of natural causes. I think it a hideous thing and don't believe the document in the slightest. I'd rather have the McQueen dress any day of the week. But now back to his catwalk shows. Some of you may have missed them and there's so much footage out there to see. Here's a little blast through some of the finer moments to whet your appetite, inform, inspire and delight. My own favourite catwalk show was when he placed the models inside a mirrored box so that they couldn't see the audience. Instead they danced and played up infront of their own image in the mirrors. All the while the audience sat around the box being able to see through the mirrors to view the whole bizarre scene. If I'd had a ticket to sit on the front row for that - with my nose to the glass - I'd have passed out halfway through with utter overload. So whether you're new to the world of McQueen or you love him as much as - or more so than - I do, glory now in his work, his mind, his creativiy. They say the way to ease a soul after it's passing is to think good thoughts of them rather than to weigh the soul down to earth with tears, inviting the soul to comfort those left behind. His soul is with his mother now, the woman who obviously nurtured him and his talent and who passed away but days before him. Let them be together and at peace. RIP. lovely tribute and blog!